When thirteen-year-old Ayano Keiko got the chance to take part in the first run of the Sword Art Online virtual reality game, what she expected was a fun way to spend her free time. She could never have imagined that the game would soon become a ruthless struggle for survival. What gets Keiko through the months of danger and hardship is her bright and determined personality and the help of a faithful companion. 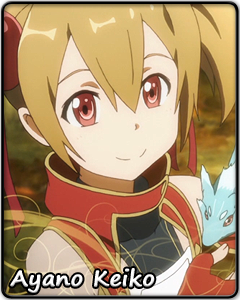 As the beast-tamer Silica in-game, Keiko raises the feather-dragon Pina with all her heart, caring for its safety as much as she does her own. Pina is no less devoted to its master, and the two form a tag-team worthy of respect. But while Keiko might be a warrior in the game world of Sword Art Online, she is still a young girl at heart. There are times when her short temper gets her into trouble, and her reason can be clouded by her pride. Outside of battle, she has her scatterbrained moments which often land her in embarrassing situations. But even if something happens to get her down, Keiko will be back to a smile a moment later. This might be the secret charm that lets Keiko attract people and magical creatures alike.